U.S. stocks ended mixed Tuesday, as investors welcomed a better-than-expected report on the U.S. housing market ahead of a key speech by the chairman of the Federal Reserve later this week. The S&P/Case-Shiller national home price index, which covers more than 80% of the housing market in the United States, rang up a 6.9% gain in the second quarter. Analysts had expected a 0.3% decrease. "With these numbers, it looks like we continue to be on a road to recovery, but it's not a super highway," said Rex Macey, chief investment officer at Wilmington Trust Investment Advisers. "It feels like a country road, where you're slogging along a slow, bumpy, muddy track." The Dow Jones industrial average fell nearly 0.2% and the S&P 500 slid 0.1%. But the Nasdaq added 0.1%. Macey said that the fact that the positive news on the U.S. housing picture didn't send markets through the roof is a sign of what he calls a "healthy market." "When you have little changes day-to-day, that's a greater indication of health than when you have the Dow moving triple-digits on a daily basis," he said. "It suggests that people are reacting more rationally and less emotionally, figuring out what the fundamentals really are as opposed to just pulling the trigger based on macro events." Investors are also gearing up for Friday, when Fed Chairman Ben Bernanke speaks in Jackson Hole, Wyo. Investors are hopeful that he will give stronger hints about taking stimulus action to ease concerns about a slowdown in U.S. economic growth. Investors are also keeping tabs on oil prices, which crept up 86 cents Tuesday to $96.29 a barrel, as Tropical Storm Isaac curtailed oil production along the Gulf of Mexico. The national average price for a gallon of regular gas continues to increase, hitting $3.76 Tuesday, according to AAA. Experts say that prices could shoot up another 10 cents fairly quickly, depending upon the extent and duration of the refinery shutdowns. World Markets: European stocks closed lower Tuesday, amid concerns over global growth. Britain's FTSE 100 was flate, while the DAX in Germany lost 0.6% and France's CAC 40 fell 0.9%. Spain's economy continued to contract in the second quarter, fueling concerns that the country will need a large-scale financial rescue. The economy shrunk by 0.4% between April and June, following a 0.3% drop in the first quarter. Economy: Consumer confidence tumbled in August, marking the worst reading since November. The sharp decline was driven by growing concern about the job market, along with a dour outlook for business conditions over the next six months. The closely watched index from The Conference Board fell to 60.6 from 65.4 in July. That was worse than the 65.7 expected by economists surveyed by Briefing.com. Shares of Movado Group Inc (MOV). shot up 17% after the luxury watchmaker reported better-than-expected earnings and raised its forecast for the year. H.J. Heinz Co (HNZ) Chief Executive William Johnson said the food company expects to report strong first-quarter results Wednesday, sending the company's shares nearly 3% higher in afternoon trading. Shares of Lexmark (LXK), known for making printers, shot up 17% Tuesday after the company announced it would fully exit the inkjet consumer business, lay off 1,700 workers and focus on its more profitable imaging and software businesses. Lexmark also announced an additional $100 million stock buyback. Best Buy (BBY) shares rose Tuesday, a day after the electronic retailer's announcement that it will give its founder, Richard Schulze, the chance to take a closer look at its financial statements as he finalizes a takeover proposal. Currencies and commodities: The dollar lost ground against the euro, the Japanese yen and the British pound. Gold futures for December delivery fell $6.10 to $1,669.50 an ounce. 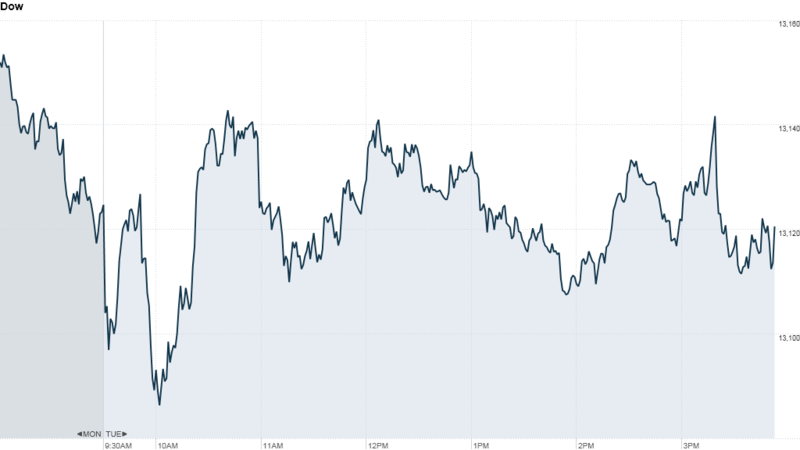 Bonds: The price on the benchmark 10-year U.S. Treasury rose, pushing the yield down to 1.63% from 1.68% late Monday.